Everyone has their list of places they want to travel to or things you dream to see - your wish list. To see the northern lights was one of those on my list. 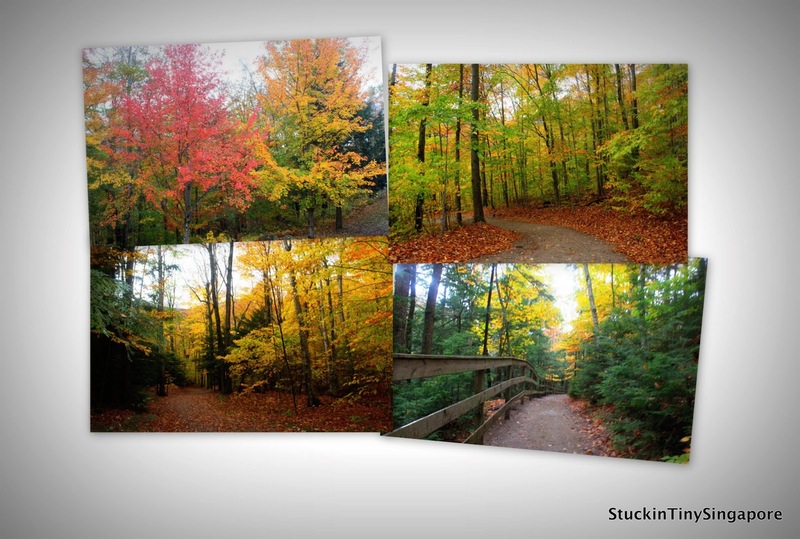 The other 'hot' item on my list is to see the autumn foliage in New England, USA. This phenomenon happens during autumn when the green leaves of deciduous tress found in many temperate regions turn to many different shades of yellow, orange and red. In some areas of Canada and the United States, it is a busy tourist area where people come from all over the world to witness this amazing sight. One of the busiest areas to view the trees is in New England, on the northeast coast of USA. It comprises of six states of Maine, New Hampshire, Vermont, Massachusetts, Rhode Island and Connecticut. For our trip, we only had 2 weeks, so we concentrated on New Hampshire, Vermont and Massachusetts. Our trip started with a long flight from Singapore via Thai airways as they had a great business class deal to fly into LAX. We had a good sleep in LAX hotel before hoping on a flight from LAX to Manchester, New Hampshire. The trip started with a hiccup as we needed to change at Philadelphia to Manchester, only to find out our onward flight was cancelled due to heavy rains earlier on. 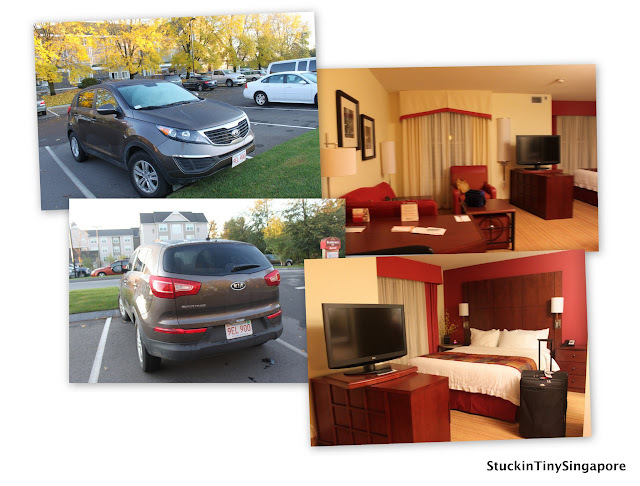 In the end, after a big delay, we flew into Boston, managed to get a rental to drive to Manchester where we found our lost luggage and headed towards our hotel in Concord for a night. The place we booked in Concord was a Residence Inn Marriott. I would definitely recommend them as it was a beautiful room with kitchen facilities and a living room. We arrived only after midnight and was leaving straight the next morning, so didn't get to really enjoy the room much. In New England, other than the autumn foliage, another thing that tourists come to see are the covered bridges. Most of these bridges were built in the early 19th Century, and although covered bridges can be found in many regions of the US and Canada, New England are well known for their collection of preserved bridges. They also made beautiful subjects for lots of photography enthusiasts. 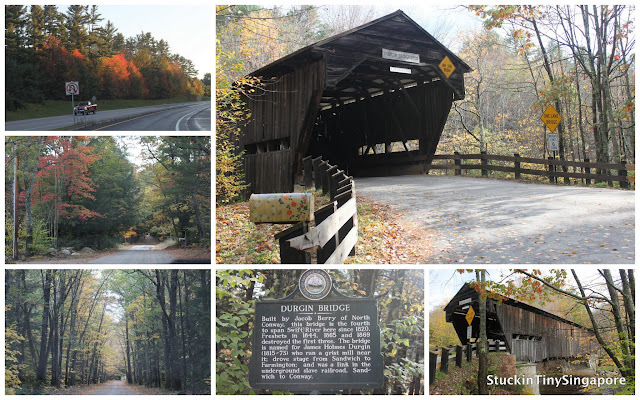 One of the first bridges we saw was the Durgin Bridge in North Sandwich, New Hampshire on our drive up from Manchester to go to Lincoln. It was so pretty and timeless - quintessentially New England. We were going up to Lincoln to catch the fall foliage train at Hobo Railway. On the train, you get to travel through Franconia Notch National Park and see the autumn trees and the beautiful scenery. It was a 80 minute round trip, travelling along the banks of the Pemigewasset River, so you could sit back and enjoy the ride. There was even food served on board if you wanted to enjoy some simple American fare. After the train ride, we headed back towards Franconia Notch State Park. 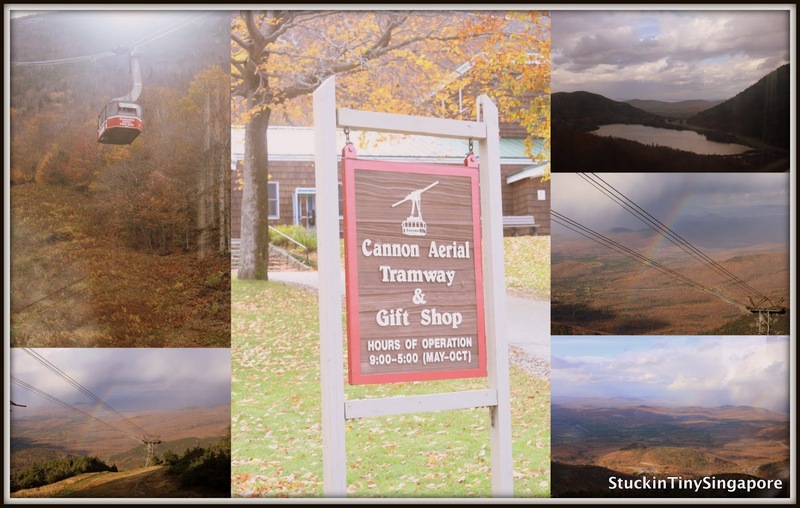 There are several noteworthy sites to visit there - Flume gorge, Cannon Mountain Tramway, just to name a few. We visited both of the mentioned sites. The Flume gorge was great as there was a lovely walk along the gorge. Your visit to the gorge starts at the visitor's center. You can either choose to walk through or a two mile loop, either way you will get to see the Flume, which is a natural gorge that extends 800 feet at the base of Mount Liberty. 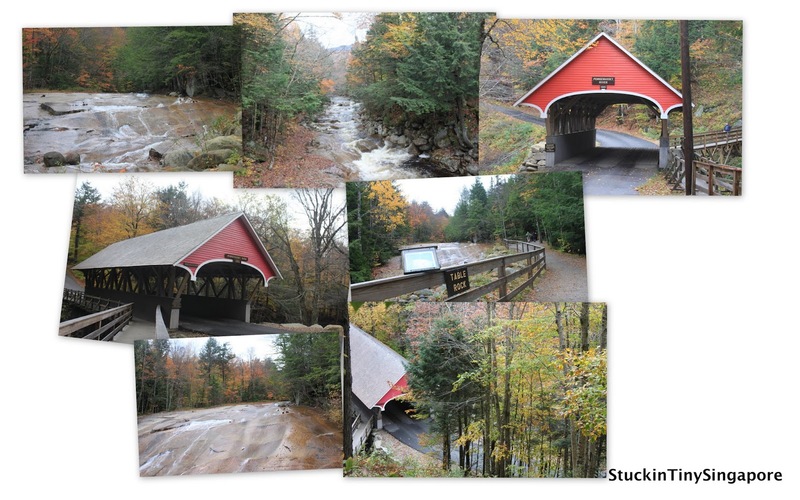 You will also get to see the Flume covered bridge going over the Pemigewasset river. Another attraction is the table rock, which is a section of Conway granite that is 500 feet long and 75 feet wide that actually looks like a table due to the erosion of the river. As you climb towards the top of the Flume, you will get a close view of the Avalanche Falls, a waterfall of 45 foot drop as the Flume Brook enters the gorge. 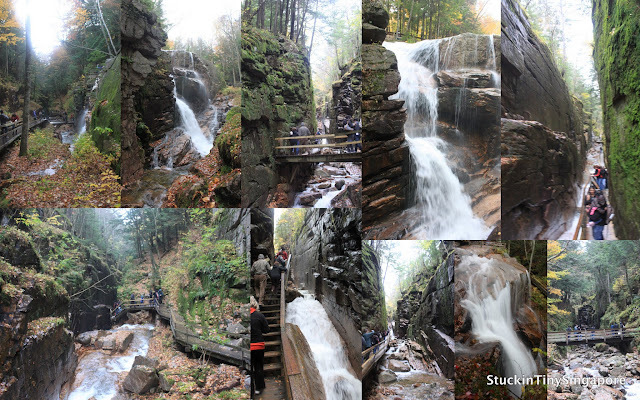 All in all, the visit to the Flumes was a wonderful stop in Franconia Notch State Park. The next top was the Cannon Mountain Tramway. It is a 4080 foot peak situated in the Franconia Notch State Park. 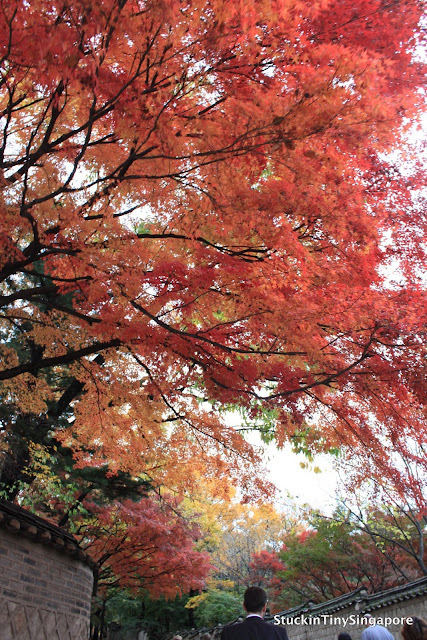 It is known for its skiing during winter, and in autumn, it's a great way to get a look of the surrounding area and the lovely colours of autumn. 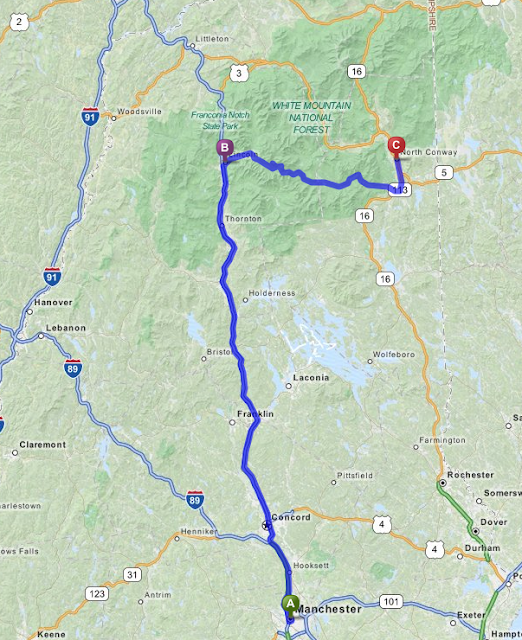 We finished day 2 covering the area before ending at our stop in North Conway. More to come later.